If you wanted to write a screenplay for a Hollywood movie about an event horse, you couldn’t invent a much more dramatic tale than the story of Neville Bardos. Neville, who was named the United States Equestrian Federation Horse of the Year for 2011, is trained and ridden by Boyd Martin, who spends his winters in Aiken at Bridle Creek Farm. Boyd and Neville were the top U.S. finishers last September at the Burghley four star event in England, as well as the highest placed American competitors at the World Equestrian Games in Kentucky in 2010. They are currently on the “A” list of riders and horses being considered for a spot on the 2012 United States Olympic team. Although Neville’s competition record is impressive, his personal tale is what makes him so compelling. Neville should never have been able to compete at Burghley, and that he did is little short of a miracle. Just two months before the event, he survived a devastating barn fire, and was lucky just to be alive, much less galloping over the most grueling cross country course in the world. Neville Bardos, like Boyd Martin, was born in Australia. Boyd, the son of an American mother and an Australian father (both of them Olympians, his mother in speed-skating and his father in cross-country skiing) took to event riding at an early age. Neville was bred at the Woodlands Stud in New South Wales and was destined to be a racehorse. He ran seven or eight times, but those races were “pretty disappointing,” according to Boyd, who bought him for $850 when he was three. He was a wiry, 16.1 hand chestnut gelding with a penchant for cribbing and a strong personality. Boyd and his wife Silva, who is a dressage rider, brought Neville up through the ranks in Australia. His first event in 2002 was inauspicious. Silva was riding him; he dumped her on the cross-country course and it took 15 minutes to catch him. He got better as the years went on, and in 2006 he won both the Coffs Harbour CIC three star and the Melbourne CCI two star. He came to America with Boyd in 2007, and began competing successfully at the three star level. Meanwhile, Boyd, who holds dual citizenship as an American and an Australian, switched his competitive nationality so that he could ride for the United States. Neville’s career really took off in 2009, when he won the Fair Hill CCI three star, followed by a fourth place finish at the Rolex Kentucky CCI four star, and then went on to the World Equestrian Games. He started 2011 with a second place effort in the Advanced at Red Hills, where he sustained a slight strain to his shoulder, and so went back to the farm to rest. In the spring, Boyd had moved his stable from Aiken to Pennsylvania, to a barn at Phillip Dutton’s True Prospect Farm in West Grove. In addition to Neville, Boyd also had a number of other top horses, as well as some young prospects. Things were looking good for the Martins and their connections. And then tragedy struck. The stable that housed Boyd’s horses caught fire in the middle of the night on May 31. Three working students living in an upstairs apartment were awakened by the noise, sounded the alarm and began to evacuate the horses. Boyd and Phillip rushed to the scene. By the time they got there, the barn was engulfed in flames. Four horses had gotten out, but seven, including Neville, were still inside. Firefighters had arrived, but were not making any effort to rescue the remaining animals. So Boyd and Phillip did, going into the burning barn and grabbing the first horse they could reach in the smoky darkness. That horse was Neville Bardos. He had been in the heat and the smoke for 45 minutes. They pulled him out by his cribbing collar while he gurgled and coughed. Then they tried to return to the barn to save more horses, but the smoke was too thick, the fire was too hot and it was too late. Six horses died. Neville and three of his stablemates were transported to the George D. Widener Hospital for Large Animals at the University of Pennsylvania New Bolton Center. Although Neville seemed bright and alert, medical tests revealed that he was in bad shape. He was dehydrated. He had burns on his face and on his back. He had a thick nasal discharge filled with soot and ash and the inside of his throat was charred. He was given fluids and put on oxygen. Boyd hoped that he would recover, knowing his future was seriously in doubt. But Neville Bardos is a horse with a fighting spirit. He surprised the veterinarians by continuing to eat and drink and crib, even though his bloodwork and other tests said he was severely injured. They began sending him for daily sessions in a hyperbaric chamber. It seemed to work. He improved enough to be discharged from New Bolton on June 7, and then he continued improving. Soon, he was back under saddle and back in training. Boyd watched him carefully for any signs of distress, vowing to back off if it seemed that the horse’s lungs were not up to the work, but Neville acted as if nothing had ever happened. By July, he was competing again, and in September, just 8 weeks after the fire, he was one of fewer than a dozen horses to go double clear on the cross country course at Burghley. It was a huge course, featuring 33 difficult jumping efforts. Neville Bardos, who is owned by 10 people in the Neville Bardos syndicate, is currently training at Bridle Creek Farm, with occasional forays off the farm to compete. 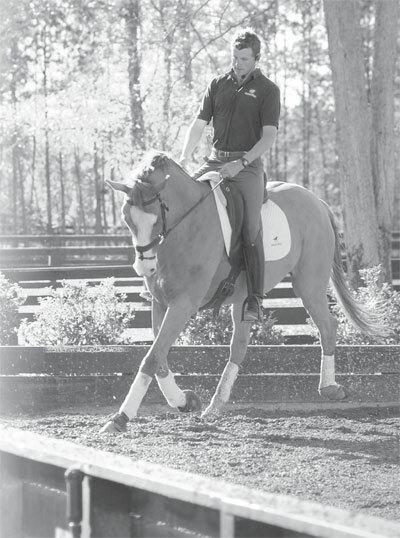 He was named the USEF Horse of the Year on January 13, and the next day, he competed at the Ocala Winter Dressage Festival under Silva in Florida. His next competition will also be at a dressage show, this time in Charleston, and his first horse trial of the year will be at Southern Pines, N.C. in March. In the meantime, he is attracting quite a bit of media attention, with articles on the front page of the New York Times, and talk of his being featured in a television documentary. What does he think of his new fame?